In a time of escalating costs for patients and hospitals, waste-reduction strategies in healthcare are increasingly relevant and worthy of consideration. Within anesthesia departments, a significant portion of the operating budget is devoted to pharmaceuticals; wastage of anesthesia drugs is common and a possible target for cost-reduction strategies (Weinger, 2001). Targeting drug wastage is particularly attractive since these protocols would not limit specific drug selection by anesthesia providers (Gillerman & Browning, 2000). Although waste in drug administration could be the result of the difficulties associated with anticipating variations in patient responses, waste-reduction strategies may reduce cost without substantial effects on patient outcomes (Weinger, 2001). It may be possible to estimate rational amounts of drugs needed before a procedure while better preserving unused drugs under optimal and sterile conditions (Nava-Ocampo, Alarcón-Almanza, Moyao-García, Ramírez-Mora, & Salmerón, 2004). Wastage is particularly prevalent with intravenous drugs due to the fact that these drugs, as opposed to inhaled anesthetic agents, are packaged in discreet amounts (Smith, 2003). Due to concerns about infection control, partially used ampoules and syringes are discarded at the end of a procedure. Unused syringes are frequently discarded as well. For the purposes of the study, drug wastage refers to drugs in syringes, ampoules, or IV bags that have not been fully used yet cannot be reused due to expiration or contamination concerns. This study also considers the wastage of unused materials that are discarded due to safety concerns. In particular, the study focuses on arterial lines, hot lines, laryngeal masks, oropharyngeal and nasopharyngeal airways (OPAs and NPAs), and endotracheal (ET) tubes. Past studies focusing on anesthesia wastage measured drug waste by recording unused or partially used drugs that were discarded at the end of the workday (Weinger, 2001) or indirectly by analyzing hospital records (Gillerman & Browning, 2000). The present study sought to supplement the results of these studies by measuring the drugs and unused materials discarded directly after cases. By surveying the entire anesthesia workplace – including the trash container – the study aimed to comprehensively measure drug and material wastage during anesthesia care in the operating rooms of one teaching hospital. This study was conducted in the operating rooms of the University of Washington Medical Center. During three nonconsecutive weeks (07/04/11 to 07/21/11 and 08/01/11 to 08/04/11), a research assistant recorded the supplies and the volume of anesthesia drugs wasted during the course of 164 weekday surgeries. With the assistance of the anesthesia technicians, the anesthesia workplace was surveyed for wasted drugs and unused but discarded supplies at the end of each surgery. All opened drug syringes and containers in the anesthesia workplace were recorded and subsequently discarded. Unopened ampoules that were outdated were included in the study as well. Using appropriate safety precautions, discarded drugs and unused supplies in the trash container were also recorded. However, in order to minimize exposure to hazardous waste, syringes and drug containers in the sharps container were not considered. Controlled substances and volatile gases were not considered in this study. At this hospital, anesthesia care was primarily provided by residents and certified registered nurse-anesthetists (CRNAs), and care was supervised by attending anesthesiologists. To assure that the study procedure would not affect provider practices, providers were not generally informed of the study. Unfortunately, several anesthesia providers were aware of the study due to the nature of the procedure and the fact that the data were collected during regular workday hours. The type of drug and amount per container for each case were tabulated, and these data were used to calculate the mean drug waste per case. In addition, the number of unused and discarded drug containers was also recorded. Unused but discarded arterial lines, hot lines, laryngeal masks, OPAs, NPAs, and ET tubes were also tabulated. During the three-week collection period, anesthesia waste was recorded for 164 scheduled and unscheduled cases, reflecting a wide range of procedures. The waste from the cardiac cases, of which there were four, was not factored into the final data analysis due to the fragile nature of the procedures and the specificity of the drugs. Twenty-four different drugs were contained in the wasted syringes, vials, and bags (Table 1). The drugs most wasted by volume – from syringes and vials – were, in order, propofol, lidocaine, neostigmine, succinylcholine, ephedrine, and phenylephrine. In addition to the drugs drawn up from ampoules, a high amount of waste was the product of discarded and partially used IV bags; for instance, the mean amount of phenylephrine solution discarded in bags was 25 mL. Drugs in which the equivalent of at least one ampoule was frequently drawn up and never used included glycopyrrolate (71% unused), vasopressin (36%), propofol (32%), and rocuronium (31%) (Table 2). 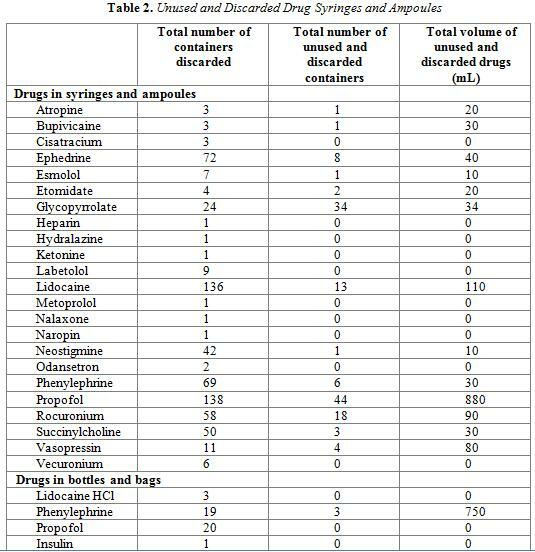 In contrast, other commonly used drugs were rarely drawn up and never used; of 136 syringes and vials of lidocaine, 90% were used at least partially. Other commonly drawn up and used drugs included phenylephrine (8.7% unused), succinylcholine (6.0%), and neostigmine (2.4%). 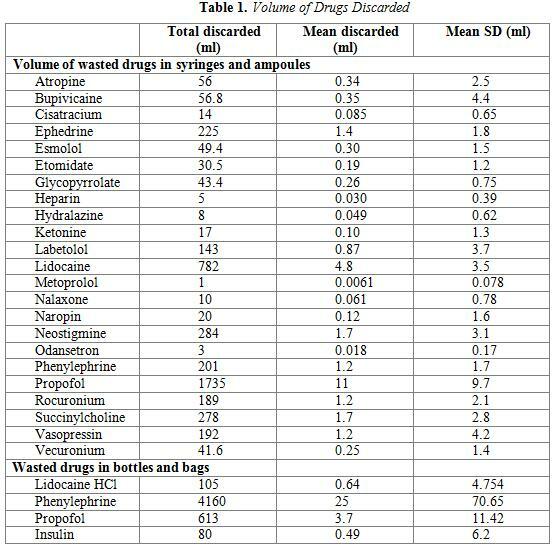 In terms of unused drug waste, propofol represented the most wastage with a mean of 5.4 mL per case. Of the wasted materials that were documented, ET tubes were most commonly unused and discarded (Table 3). The most common cause of this waste was due to the lubrication of multiple ET tubes in preparation for the case; the unused tubes were then discarded at the end of the case due to contamination concerns. However, even ET tubes were rarely wasted; a mean of 0.05 were wasted per case. The other five materials surveyed – arterial lines, hot lines, laryngeal masks, OPAs, and NPAs – were wasted even less frequently than ET tubes. Although labor comprises the largest cost of anesthesia care, drugs represent a significant cost for both patients and hospitals (Weinger, 2001). Past studies have examined different anesthesia techniques and their associated costs and have found that changes in protocols may lead to a reduction in costs without significant effects on patient outcomes (Gurung & Tomlinson, 2004). Evidence also suggests that wastage may comprise a large part of anesthesia costs (Gillerman & Browning, 2000); efforts to curtail drug and material wastage may lead to a significant reduction in costs without decreasing the quality of anesthesia care. This study examined the wastage of IV drugs and other materials during anesthesia care at the UW Medical Center; the wastage of inhaled gases and controlled substances was not considered. During three nonconsecutive weeks, the anesthesia workplace was surveyed directly after the conclusion of 164 workday surgeries representing a range of procedures. By surveying the drug trays, the exposed surfaces, and the trash containers, it was possible to record the drug and material wastage. While past studies on anesthesia drug wastage considered the drugs remaining at the end of a standard workday (Weinger, 2001) or used indirect approaches to measure waste (Gillerman & Browning), the present study’s method made it possible to record the unused materials and drugs from individual procedures. While this method implies that there may be less uncertainty in the results, the measured wastage was, nonetheless, a likely underestimate of the actual drug and material wastage. Due to safety concerns, drugs thrown in the sharps containers were not considered in the study. Furthermore, many anesthesia providers void drug syringes into the trash container at the conclusion of the case in order to prevent the misuse of anesthesia drugs. Many end-of-day cases were not considered due to the late hours, and casual observations suggest that many of the unused materials are not discarded until the end of the day. Despite these limitations, the present study found that the most wasted drugs, by volume, were propofol, lidocaine, neostigmine, succinylcholine, ephedrine, and phenylephrine. On average, anesthesia providers wasted a mean of 11 mL of propofol per case in syringes and vials. Unused – or almost unused – IV bags of phenylephrine also represented a significant wastage of 25 mL per case. A significant percentage of certain drug wastage was the result of discarding unused ampoules or syringes. Seventy-one percent of glycopyrrolate wastage, for example, was due to ampoules that were drawn into syringes and never used. Although the study found significant IV drug wastage, the wastage of materials was less significant. Even ET tubes, the most wasted materials, were unused and discarded only eight times over the course of 164 surgeries; a mean of 0.05 ET tubes were wasted per procedure. The specific costs of the discussed drugs were not available from the UWMC, but examining trends in the raw drug and material wastage may point to potential cost-saving strategies. Observations indicate, for example, that many providers prepare two 20 mL of propofol before each case, although one or both syringes may remain untouched throughout the case. The UWMC pharmacy prepares certain drugs such as phenylephrine and ephedrine sterilely in syringes to reduce the need for drawing up resuscitation drugs before each case. This protocol may be an effective cost-saving strategy (Bellefleur et al., 2009) but it is not necessarily extended to the preparation of other drugs, such as propofol, that may not be used during the case but are discarded after the procedure. In addition to the pharmacy’s sterile preparation of anesthesia drugs, there are several other strategies that may be effective at reducing drug waste. If the contents of an ampoule are likely to be used on more than one patient, practitioners could draw up drugs into several syringes, or “split doses” (Weinger, 2001). This protocol would require the hospital administration to weigh the costs of the drugs against the costs of additional sterile syringes and needles. A common source of drug waste in the study was the result of excessive amounts of drugs in vials and syringes. Neostigmine, for example, was stored in 10 mL ampoules, but providers rarely used more than half the vial. The mean amount discarded per vial, in fact, was 6.8 mL, implying that wastage of neostigmine would be significantly reduced if the drug was stored in 5 mL vials. Meanwhile, a mean of 5.6 mL was wasted for each discarded syringe of lidocaine. Although the ampoules in the drug tray contain 5 mL, pre-drawn syringes of 10 mL of lidocaine are prepared by the pharmacy. Similarly, 10 mL of succinylcholine are drawn into prepared syringes, but the mean drug used per syringe was 4.4 mL. Reducing the amount of lidocaine and succinylcholine in pre-drawn syringes could be a simple but effective cost reduction strategy. Another possible strategy for reducing drug wastage may be the introduction of “clean boxes” in the anesthesia workplace. Harborview Medical Center, another hospital in the UW Medicine Health System, uses these clean boxes to prevent the wastage of unused drug syringes between cases. By keeping drug syringes in a sterile environment until they are used, it may be possible to prevent the wastage of unused syringes. That said, this policy would require practitioners to keep careful track of the syringes in order to follow the UWMC protocols regarding the maximum amount of time drugs may be stored in syringes. Although past studies have shown that propofol drawn aseptically into uncapped syringes and stored at room temperature remains sterile for at least one day (Smith, 2003), the UWMC protocols require providers to discard propofol within six hours of drawing up the syringe. Weinger (2001) suggests that the development of new IV administration drug technologies could safely allow practitioners to reuse sterile drugs in a single syringe on sequential patients. This practice is currently inadvisable due to the possible reflux of contaminated fluid, but new technologies could have the potential to reduce both drug wastage and the risk of drug errors. Despite studies indicating that protocols developed to reduce the wastage in anesthesia care may decrease expenditures without significantly affecting patient outcomes, reducing wastage may not be a key priority for many anesthesia providers. Efforts to raise cost awareness within hospitals may be effective (Hawkes et al., 1994), but changes in the behavior of practitioners may be fleeting; once those efforts are reduced, so are cost-reducing behaviors (Weinger, 2001). Given the nationwide concerns regarding medical costs, however, reducing wastage in medicine should be a key priority for providers and administrators. Drug wastage represents a significant cost in anesthesia care but is potentially controllable through a variety of strategies. These strategies range from changes in provider behavior to changes in the standard amount in syringes or vials. Further studies may be indicated to measure the extent of wastage of volatile gases and other possible sources of waste and to assess the effectiveness of cost-saving strategies. Bellefleur, J., Milhaud, Y., Beconcini, G., Zieleskiewicz, L., Ortega, D., Martin, C., & Leone, M. (2000). Use of ephedrine prefilled syringes reduces anesthesia costs. Annales Françaises d’Anesthésie et de Réanimation, 28(3), 211-4. Gillerman, R. & Browning, R. (2000). Drug use inefficiency: A hidden source of wasted health care dollars. Anesthesia & Analgesia, 91(4), 921-4. Hawkes, C., Miller, D., Martineau, R., Hull, K., Hopkins, H., Tierney, M. (1994). Evaluation of cost minimization strategies of anaesthetic drugs in tertiary care hospital. Canadian Journal of Anaesthesia, 41(10), 894-901. Nava-Ocampo A, Alarcón-Almanza J, Moyao-García D, Ramírez-Mora, J., & Salmerón J. (2004). Undocumented drug utilization and drug waste increase costs of pediatric anesthesia care. Fundamental and Clinical Phramocology,18(1), 107-12. Smith, I. (2003). Total intravenous anesthesia: Is it worth the cost? CNS Drugs 17(19), 609-19. Weinger, M. (2001). Drug wastage contributes significantly to the cost of the routine anesthesia care. Journal of Clinical Anesthesia, 13(7), 491-7. Gurung, A. & Tomlinson, A. (2004). Pre-preparation of succinylcholine; significant waste for questionable benefit. Anaesthesia, 59(3), 211-5.